A jack-of-all-trades, Jenna Kinard has dipped her toes into acting, modeling and now cooking. Kinard currently resides in Fort Worth—the city where she developed her love for crafting creative cuisines. Inspired by multiple art forms, Jenna has created a space that enables her to have fun in the kitchen while still living in a relaxed, peaceful environment. But that doesn’t mean Kinard relies solely on the past for inspiration. In fact, she & her hubby are known to branch out in search of new items to add to their home. And things certainly get colorful--& flavorful--in the kitchen. 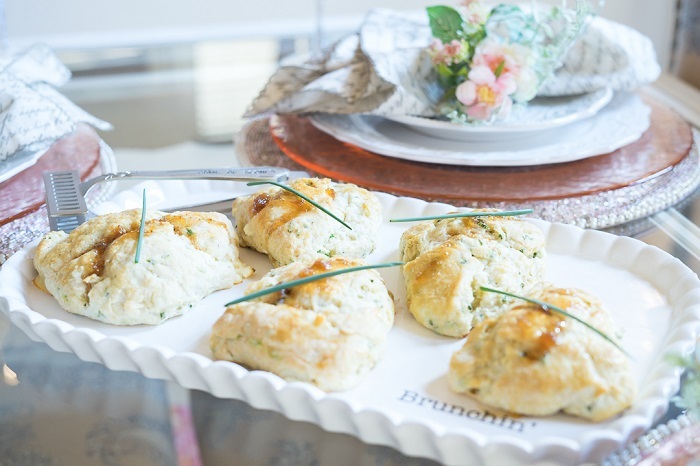 She’s certainly hoping that the Savory Goat Cheese & Chive Scones she made exclusively for Pier 1 customers do the trick. Kinard notes that she never has a master plan when she approaches a new recipe or starts to craft something in the kitchen. Instead, it’s all about how she feels in that moment. But the grocery store is not the only place where she carries this mentality. “I do the same thing while shopping for interior decor,” she says. “I let the seasons speak to me, & enjoy letting a festive spirit take over and inspire me. Whether shopping for produce or accents for her home, Jenna tries to incorporate her personality into everything she creates. Her hope is that anyone who tries her recipes or sets foot in her home can learn more about her through the process. Stay in touch with Jenna on Instagram & visit her website here. Join her as we roll out a new Pier 1 experience on April 21 in Fort Worth (433 Carroll St.) from 3 to 5 p.m. as she shares her home décor favs with us in person over a glass of rosé. Don't miss her tasty scones in person & stay tuned for a how-to video on Pinterest. In the meantime, see what's new online as Pier 1 gives DFW a sneak peek into their new look!